What is the detail for the hull to deck joint of a one-off boat built from sandwich fibreglass? The diagram below shows the normal method of doing this joint. The hull structure is stopped at the level of the deck inner skin. The timber strips are thinner than the sanwich core material, to form a recess for the overlap of the deck skins on the outside. 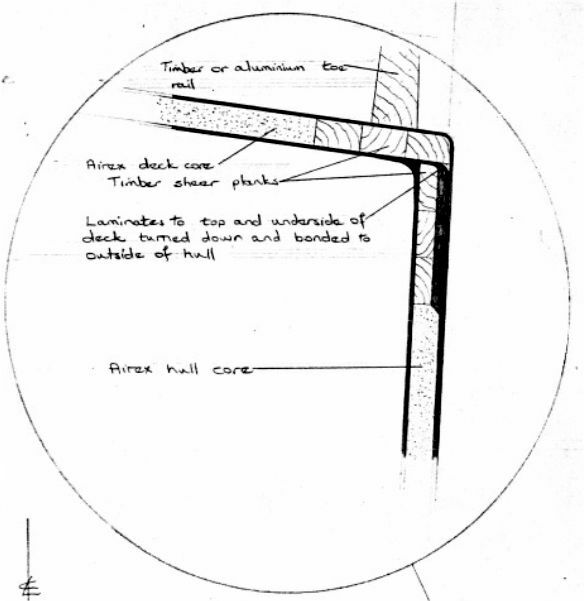 The timber in the edge of the deck is good for through-bolting toerails, cleats, fairleads and other fittings.